Inspiring Art Teachers to Explore Art History | Curator’s Corner: A Realism Backlash? After the horrors experienced by Europeans in World War I (1914–1918), the brakes were more or less put on to the prevailing trend towards modernism and abstraction, although certainly many artists still pursued such goals. Of course the opposite of this was true with the Dada artists, a relatively small group at the time. In the “school” of Paris, artists such as Amedeo Modigliani (1884–1920) typified the sort of restrained abstraction tied to traditional subject matter and emphasis on recognizable form that emerged after the war. This charming sculpture comes from the between-the-wars period. It is by a very interesting artist, my Discovery of the Week: Ernest de Fiori. If art historians ever have trouble nailing classifications for artists’ styles, the between-the-wars period is a fertile period to explore. Let’s also look at other sculpture produced at the same time as de Fiori’s. De Fiori studied art at the conservative Academy of Visual Arts in Munich starting in 1904. There he met and formed an artistic bond with the academic-romantic Swiss sculptor Hermann Haller (1880–1950) and the German romantic-Expressionist Karl Hofer (1878–1955). In Ernesto’s work I see a lot more of Hofer, and then in others I see a lot more of Haller, especially his full length figures writhing in academic angst. From 1911 to 1914 he lived in Paris, participating in the lively, experimental artistic milieu there, although he gravitated more toward the work of Paul Cézanne (1839–1906) and Auguste Rodin (1840–1917) than he did to Pablo Picasso (1881–1973) or Henri Matisse (1869–1954). After serving briefly as an Italian newspaper correspondent during World War I (1914–1918), he went to Zurich from 1917 until 1921, when he moved to Berlin and became a German citizen. His time in Zurich was the period when the radical Dada group developed, whose manifesto questioned the very nature of art. Ernesto rejected Dadaism and wrote an article critical of its aims, saying that art should maintain a connection with tradition and express the sentiments and intuitions of the world, which he considered reborn, rather than destroyed by the war. Ernesto’s sculpture, at first strongly influenced by Haller, during the 1920s, began to be less schematic, and more sensitive to the human form. His works had always shown the Expressionist tendency to reflect varied emotional states, from angst to tranquility. The 1920s was the period of Ernesto’s first portraits. This lovely portrait of his wife reflects the influence of the serene quality of Hofer’s paintings, the mottled surface of Rodin’s sculpture, and the serene psychological aura of his wife, something akin to the gentle romanticism of Paul Modersohn-Becker (1876-1907). Noguchi was born in California, but spent much of his childhood in Japan with his father’s family. He moved to Indiana at 13. While in college, he took night courses in sculpture. A 1926 exhibition of Brancusi’s sculpture in New York had a profound impact on Noguchi. He abandoned his pre-medicine studies, obtained a John Simon Guggenheim Fellowship, and went to Paris, working in Brancusi’s studio from 1927–1929. Brancusi’s work of the early 1920s was realist, based on the night courses he took with the academic Italian sculpture Onorio Ruotolo (1888–1966). Inspired by Brancusi’s massively reduced forms, however, Noguchi developed a personal abstract, which often combined high finish with rough texture. The works have a lyrical expressiveness, respect for the natural material, and a mystic quality inherent in Japanese art, grounded in the reduction of form learned from Brancusi. This portrait from his early period with Brancusi shows an awareness of the surfaces of Rodin, something reflected in Ernesto’s portrait. It also shows Noguchi’s innate ability to get to the heart of the subject, whether realistic or abstract. Orloff was a Ukranian figurative sculptor. She immigrated to Palestine when she was eighteen because of the persecution Jews faced in Ukraine. Initially introduced to dressmaking as a vocation, she went to Paris in 1910 to study to be a teacher in the art form. Once there, she discovered her passion for art and never turned back to dressmaking. She studied at the Russian Academy in Montparnasse and befriended sculptor/painter Modigliani, the expressionist-abstract sculptor Ossip Zadkine (1890-1967, Belarus), and Lithuanian abstract sculptor Jacques Lipchitz (1891-1973), whose work at the time was figurative, bordering on Cubism. Orloff herself was heavily influenced by Cubism in her early works. She first showed her work in the progressive Salon d’Automne in Paris in 1913, and by 1916 was showing in important exhibitions in Paris. Orloff’s reputation was well established by the 1920s, particularly for her portraits. Her work combined the reductive surfaces of Cubism, with a romanticism reminiscent of the work of Aristide Maillol (1861-1944). Orloff was an important figure in the establishment of an indigenous modernist sculpture movement in Israel. Living in Paris, she received visits by many Jewish artists, Zionist leaders, students and Palestinian art lovers. She also made frequent visits to Palestine. Her first exhibit there was in 1935 in Tel Aviv. She was instrumental in the founding of the Tel Aviv Museum. Ben-Shmuel began sculpting in his father’s taxidermy shop. He carved anything from pieces of chalk to rubble from construction sites. Already as a child he discovered that he had a sixth sense for bringing three-dimensional forms out of a variety of materials. His formal training was in a stone yard when he served a three-year apprenticeship as a monument (grave stone) sculptor. He also worked for other sculptors, reproducing their models in stone. Ben-Shmuel’s “neoprimitive” style evolved from his study of archaic Greek sculpture, the sculpture of ancient Mesoamerican cultures, and Oceanic and African figure sculpture. The work from these cultures confirmed his belief that direct carving of hard materials was the foundation of a solid sculptural style. He sought in his work to physically “think out” his impressions in stone. 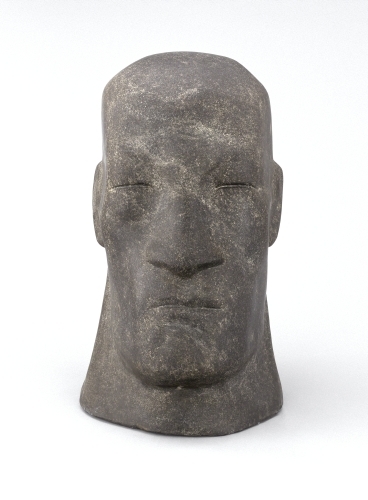 Like the unfinished male figures of Michelangelo (1475–1564) that are still part of a block of marble, Ben-Shmuel’s granite forms emerge from the block of stone into stylized, blocky forms that retain the density of the original material. Although powerful in silhouette, the carving is refined, even elegant. Pugilist was part of the landmark “First Municipal Art Exhibition” in New York in 1934. Suffering from lung disease, Ben-Shmuel turned to painting in the mid-1930s, working in an abstract style. One of his pupils was Jackson Pollock (1912–1956). Brancusi's sculpture, although it defies connection with any one avant-garde style in the early 1900s, is universal in that every style that followed him seemed to embrace something from his aesthetic. He originally studied cabinetmaking, then sculpture, before moving to Paris in 1904. There he studied briefly under Rodin, although he rejected the dramatic, angst-ridden figures of that master as too traditional. While he admired Rodin's exploration of segmented natural forms, Brancusi was more interested in reducing such fragments of reality to the utmost simplification. Brancusi was inspired by ancient, non-western cultures such as African and Oceania, and folk art traditions, any aesthetic that by-passed the western academic tradition. He worked with few themes, usually related to human forms, and rarely deserting the figure. 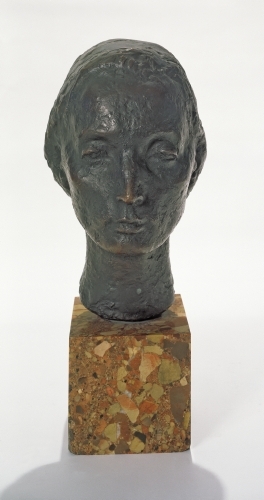 This is the second version of his portrait of Margit Pogany (versions I and III are carved in marble). The figure is reduced to the most elementary of descriptive shapes. 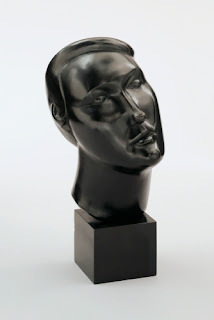 The features are reduced to faceted shapes reminiscent of Cubism, although Brancusi's forms contain an elegant decorativeness not evident in Cubist renditions of the human figure with the emphasis on elapsed time. We end this study of between-the-wars sculpture with one of the most important, pioneering women artists of the 20th century: Sophie Taeber-Arp. She was not only influential in the Dada movement when it began (ca. 1915, Zurich), she was also a pioneering teacher in the early 1900s movement that led to the development of the Bauhaus, merging fine art with functional art. Taeuber-Arp studied drawing in Davos and at the drawing school of the Museum of Industry and Design in Sankt Gallen. In 1910 she studied at the Reformed Art School in Munich, a ground-breaking school that taught the integration of visual and applied arts. She joined the Swiss Association of Workers in 1915, the same year she met her future husband Jean Arp (1886–1966). 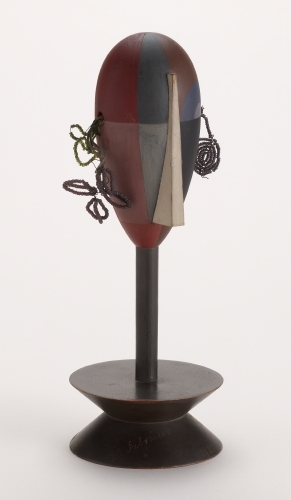 At the time Taeuber-Arp was creating collages, small sculptures from assorted common objects, and textile designs. She also performed at the Dada-Evenings at the Cabaret Voltaire and Galerie-Dada in Zurich. Although the 1920s began her career path in textile and interior design, she continued to produce works in the Dada aesthetic. Please contrast this head, which Taeuber-Arp maintained was a portrait of a woman, with that of Ernesto. One can probably see the difference in aesthetic point of view! This head is a combination of found objects, something that the Dada artists pioneered, and that the Surrealists brought to perfection. It certainly lacks the “personal touch” of Ernesto’s portrait, although its mask-like appearance implies the influence of Oceanic and African masks that were such a major influence on modernist sculpture at the time.